« How Much Federal Government Revenue is Enough? 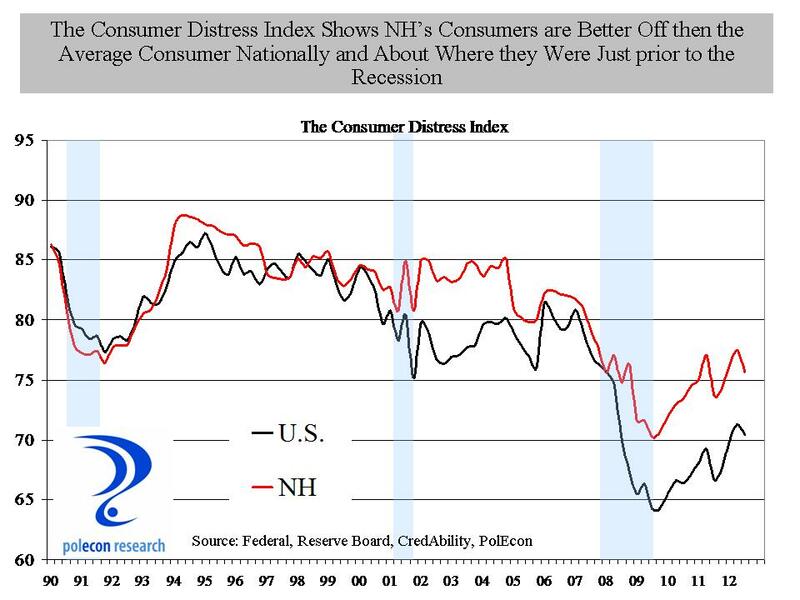 Measuring Consumer Financial Distress, are We Really Better Off Today? The Consumer Distress Index is a quarterly comprehensive picture of the average American household’s financial condition. The index is calculated for the nation and each of the 50 states. The index measures 5 categories of personal finance that reflect or lead to a secure, stable financial life—Employment, Housing, Credit, Household Budget and Net Worth. It is calculated by CredAbility, a nonprofit credit counseling service, uses 65 data points using public and private data to measure consumer financial distress. According to their Consumer Distress Index, only 12 states have lower levels of financial distress among households than does New Hampshire. Lower scores indicate higher levels of financial distress. The chart below compares NH with the U.S. average. It shows that, by this measure, NH households are about as financially well-off as they were just prior to the recession, but that the financial health of households has generally deteriorated since the second-half of the last decade. Not surprising given the increases in employment insecurity and decreases in the value of most households largest asset, their home. By that scale NH, with a score of 75.68 is “At-Risk”, while the U.S. average household is bordering on “unstable/distressed” with a score of 70.48. According to this measure, NH households are about or just slightly below where they were prior to the recession in terms of financial distress, while the average U.S. household is in more financial distress than they were prior to the recession. I don’t know how much concurrent validity this measure has but I do know that if I had used it, instead of a state-level “misery index” (the sum of unemployment and inflation) to predict the outcome of the election it would have been a less accurate predictor of election results. This entry was posted on November 15, 2012 at 2:28 pm and is filed under consumers, Financial, Household Finances. You can subscribe via RSS 2.0 feed to this post's comments.